Brainwashed - Charalambides, "Charalambides: Tom And Christina Carter"
Charalambides, "Charalambides: Tom And Christina Carter"
Charalambides founders Tom & Christina Carter follow a vision of iconoclastic music as transformative force. Touching on the outer limits of acid folk, psych rock, and improvisation, their sound remains uniquely personal & consistent. Since 1991, Charalambides has released many recordings on labels like Siltbreeze, Kranky & Wholly Other. Despite Tom and Christina Carter's prolific solo careers and numerous other projects, Charalambides has existed in an unbroken trajectory for over two-and-a-half decades, outlasting the genres that critics and other yardstick-makers have tried to cram them into. Their recent performances and recordings retain the directness and delicate menace that mark their early releases, even as they explore an interlocking musical telepathy honed by years of artistic collaboration. 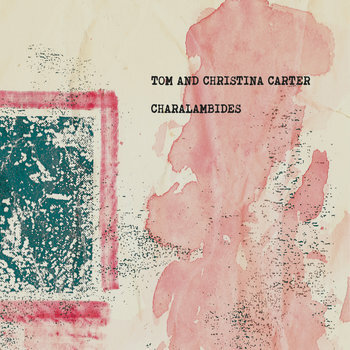 Aptly tilted Charalambides: Tom and Christina Carter, the newest album from Charalambides furthers the duo's deep psychic understanding of music. Laid down in two sessions with no overdubs, the album entwines their best known approaches into a raw, fragile, wordless and hypnotic whole. It's definitely the duo at their most exquisite.